There’s only two days until Apple announces the next iPad on Wednesday, March 7th, but cases for the tablet have already started shipping in sealed boxes. A pink sticker on top of the boxes saying "Do not display until official iPad 3 launch" confirms this, a tipster revealed. The shipment is not of just a few cases - there’s over a 1,000 Targus Versavu 360 stands for the next-gen iPad shipping to Best Buy, meaning that it won’t be long until the actual tablet hits shelves. Also, this confirms that Apple has picked "iPad 3" for the name rather than "iPad 2S," or some other variation. We know that Apple usually unveils products shortly before their launch, and this hints that the iPad 3 will follow the same routine. Interestingly, the iPad 3 shouldn’t differ much from the second-gen tablet in terms of pure dimensions. It’s expected to be a hair thicker due to a larger, more capable battery, with tapered edges and otherwise similar design. 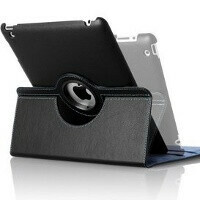 Just enough of a change for case makers to introduce new clother for the iPad 3 and we're curious whether this means that iPad 2 cases won't fit it. Previous rumors agreed that the new tablet will feature the same 9.7-inch display, but this time with a crystal clear resolution of 2048x1536 pixels. The iPad 3 is said to come with only the A5X chip, a version of the old dual-core A5 but with higher clock speed. Cupertino will allegedly leave the 28nm A6 chip for future devices. The next iPad should also sport improved cameras. Along with that, Apple could introduce new apps at the event, highlighting the allegedly better cameras. My next tablet is Samsung Galaxy Tab 2 (11.6) not iPad 3 with most Samsung components inside and it is the hottest iPad ever. Say about the iPhone what you want, but the iPad is awesome. iPad2s.. let's not forget that .. Right now Apple is the only company innovating. The rest copy Apple. Until that changes Apple will stay on top. i really lik my iPad 2...but can't WAIT for my WINDOWS 8 TABLET!!!! Already in LOVE with the OS. Wooo hooo. It's kind of like...i really LIKE my toy Smart car (ipad), but can't wait to drive my Porsche. Hang on kids.